On April 9th 2016 a mega transportation took place on the river Oude Maas. A number of tugs brought the brand new platform Montrose, that has been built for the offshore industry, from Heerma in Zwijndrecht to Mammoet at the Wiltonhaven in Schiedam. The unique transportation over the Oude Maas was accompanied by various vessels. Several tugs were needed in order to manoeuvre the construction safely underneath all the bridges. 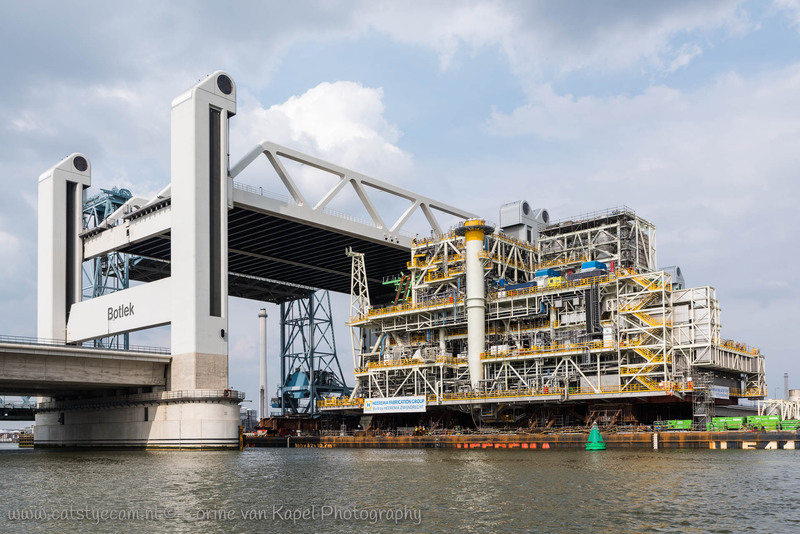 With 46 meters in height and a draught of almost 9 meters it could only just pass under the Spijkenisser bridge and the Botlek bridges. At Spijkenisse the transportation had to stop untill half past three. It had to wait for the current to come to a standstill, before it could pass the Spijkenisser bridge. After that it also had to pass the Botlek bridge. All bridges were open for an extra long time, to provide the platform a safe passage. The transportation attracted a lot of interested people watching the spectacle from the shores of the river. For me it was a good opportunity to photograph.